I have completed my portion of ATom-2, landing in Christchurch, New Zealand on February 6th, and leaving New Zealand on February 9th. It took a couple of days for me to readjust my internal clock to where I live (Boulder, CO). Upon writing this post, the NASA DC-8, and the scientists, have already flown to and completed the next leg of ATom-2: flight from New Zealand to Chile. This flight provides a very unique opportunity to look at the impacts of pollution on the remote atmosphere around Antarctica and the Southern Ocean. But prior to that flight, I had participated in the flight from Fiji to New Zealand. 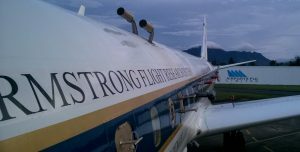 NASA DC-8 prior to take-off from Fiji. Tropical mountains in the background. This provided the opportunity to investigate and compare southern mid-latitude remote atmosphere between the southern hemisphere’s winter and summer. Models were predicting that this atmosphere should be strongly impacted by biomass burning from South America and Africa, at this time, unlike during the winter months (see image below). Image of fires detected in space between January 31, 2017 and February 9, 2017. Image courtesy of NASA, and found at https://lance.modaps.eosdis.nasa.gov/cgi-bin/imagery/firemaps.cgi. During, and even after the flight, there was a lot of discussion about whether we had observed air influenced by these emissions. 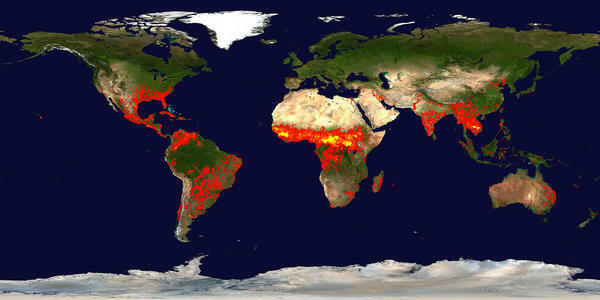 As seen in this animations from NASA, biomass burning and forest fires affect numerous parts of the world, including remote regions. One of the big questions is how much does biomass burning influence the chemistry of remote regions, and what is the seasonality of this source of pollution. So far, the two ATom missions have provided valuable measurements for us to answer this question, and the next two missions will allow for probing into the extent of the effects of seasonality. There are a total of 5 more flights to complete the ATom-2 mission, and these flights will focus on the remote Atlantic atmosphere. I am hoping that ATom-3 will provide me the opportunity to partake in this portion of the mission, and provide the opportunity to blog about it.